Those who conquer their minds are beings of renunciation and detachment. 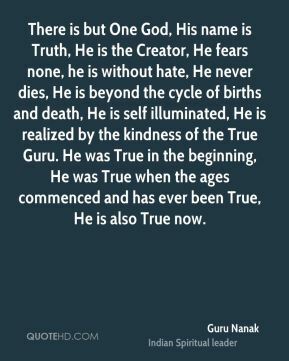 They are beings of renunciation and detachment they are lovingly focused on the True One, they realize and understand themselves. 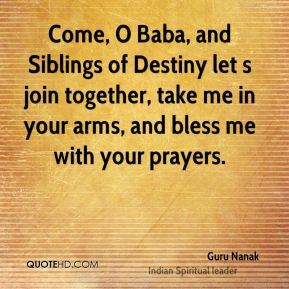 Come, O Baba, and Siblings of Destiny let s join together, take me in your arms, and bless me with your prayers. 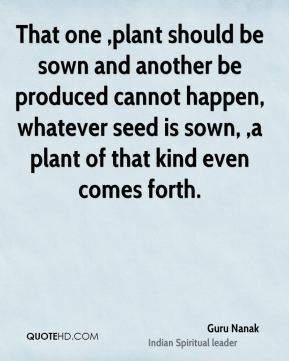 That one ,plant should be sown and another be produced cannot happen, whatever seed is sown, ,a plant of that kind even comes forth. 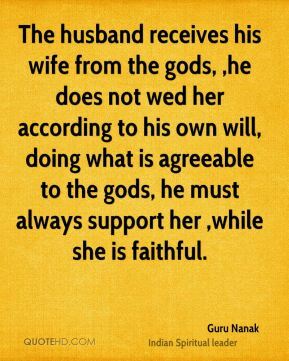 The husband receives his wife from the gods, ,he does not wed her according to his own will, doing what is agreeable to the gods, he must always support her ,while she is faithful. 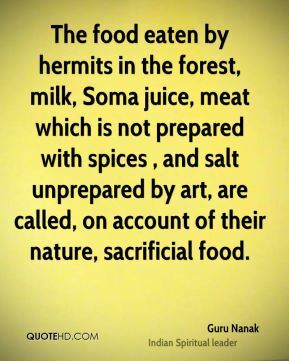 The food eaten by hermits in the forest, milk, Soma juice, meat which is not prepared with spices , and salt unprepared by art, are called, on account of their nature, sacrificial food. 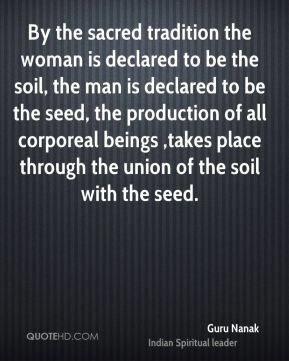 By the sacred tradition the woman is declared to be the soil, the man is declared to be the seed, the production of all corporeal beings ,takes place through the union of the soil with the seed. 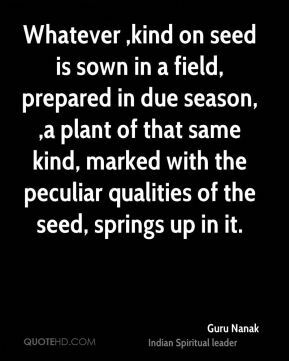 Whatever ,kind on seed is sown in a field, prepared in due season, ,a plant of that same kind, marked with the peculiar qualities of the seed, springs up in it. 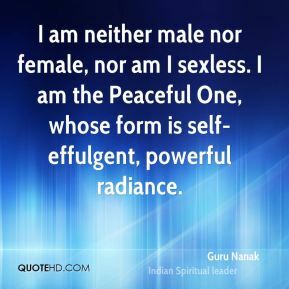 Day and night woman must be kept in dependence by the males ,of their ,families , and, if they attach themselves to sensual enjoyments, they must be kept under one s control. 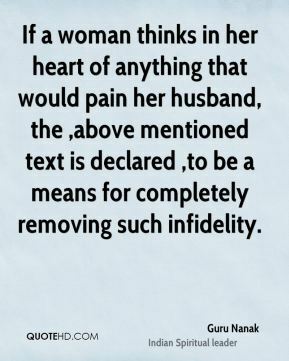 If a woman thinks in her heart of anything that would pain her husband, the ,above mentioned text is declared ,to be a means for completely removing such infidelity. 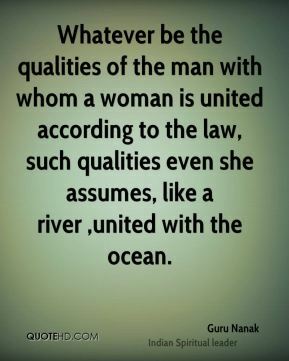 Whatever be the qualities of the man with whom a woman is united according to the law, such qualities even she assumes, like a river ,united with the ocean. 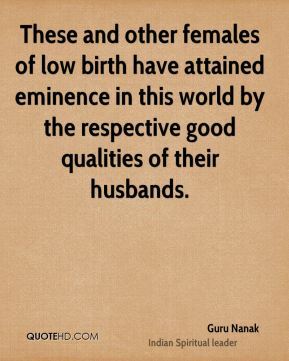 These and other females of low birth have attained eminence in this world by the respective good qualities of their husbands. 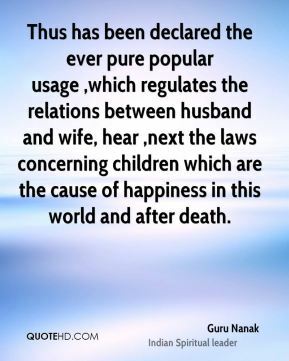 Thus has been declared the ever pure popular usage ,which regulates the relations between husband and wife, hear ,next the laws concerning children which are the cause of happiness in this world and after death. 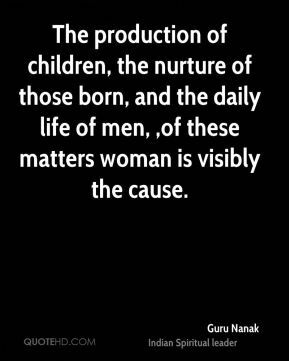 The production of children, the nurture of those born, and the daily life of men, ,of these matters woman is visibly the cause. Offspring, ,the due performance on religious rites, faithful service, highest conjugal happiness and heavenly bliss for the ancestors and oneself, depend on one s wife alone. 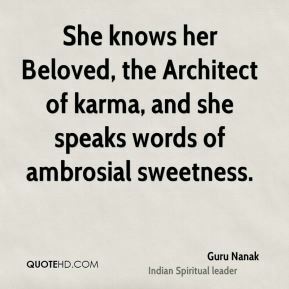 She knows her Beloved, the Architect of karma, and she speaks words of ambrosial sweetness. Far from wife and son am 1, far from land and wealth and other notions of that kind. 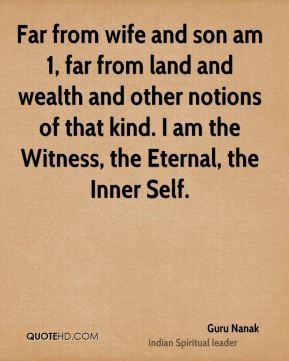 I am the Witness, the Eternal, the Inner Self. Through True Love, she merges with Him. 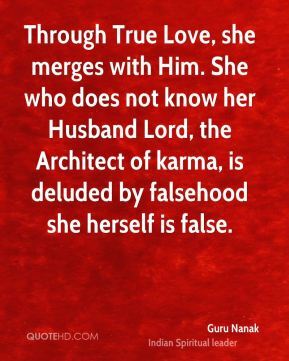 She who does not know her Husband Lord, the Architect of karma, is deluded by falsehood she herself is false. 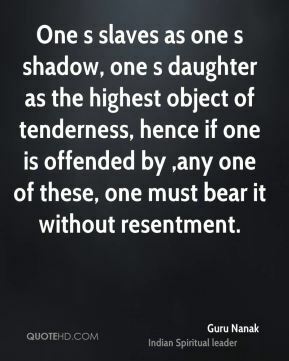 One s slaves as one s shadow, one s daughter as the highest object of tenderness, hence if one is offended by ,any one of these, one must bear it without resentment. 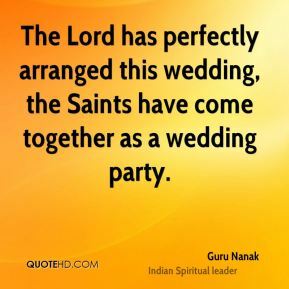 The Lord has perfectly arranged this wedding, the Saints have come together as a wedding party. 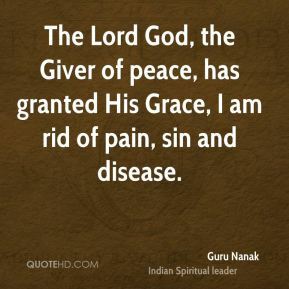 The Lord God, the Giver of peace, has granted His Grace, I am rid of pain, sin and disease. 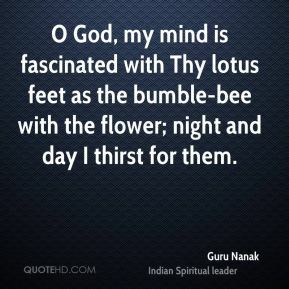 Deep within, she is attuned to His Love, intoxicated with delight, her enemies and sufferings are all taken away. 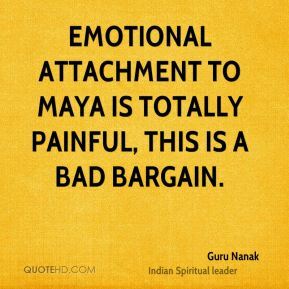 Emotional attachment to Maya is totally painful, this is a bad bargain.